Our website was ground breaking when it launched way back in 1995 as it allowed you to check stock, get live pricing and place orders online! That’s nothing new today, unfortunately our 3rd version took somewhat of a step backwards when we changed companies to allow the website to write into our back office software however this is now our 4th re-incarnation and by far the best yet! This new site has many new and exciting features the most important being its speed, now we have migrated all our IT systems into an AWS cloud environment we have a blistering fast website. You can search products better than ever before with a new sidebar category finder (when viewed on a desktop or tablet). The new site has been optimised to be responsive for use on mobiles or tablets. The search facility has been vastly improved also, you can still save orders as templates but we have added that you can save products as favourites now too. Another new feature added is the ability to leave a review on a product handy if you wish to share your experience with others within the industry whether that be a rave about something or even a rant perhaps! You can now see order history making repeat purchasing easier and see what might be outstanding if you hold a credit account facility. You can also add amend or delete delivery addresses against your company handy for when you regularly send equipment to a new building site you have a project on or have a specific address you sometimes want to store equipment at perhaps. 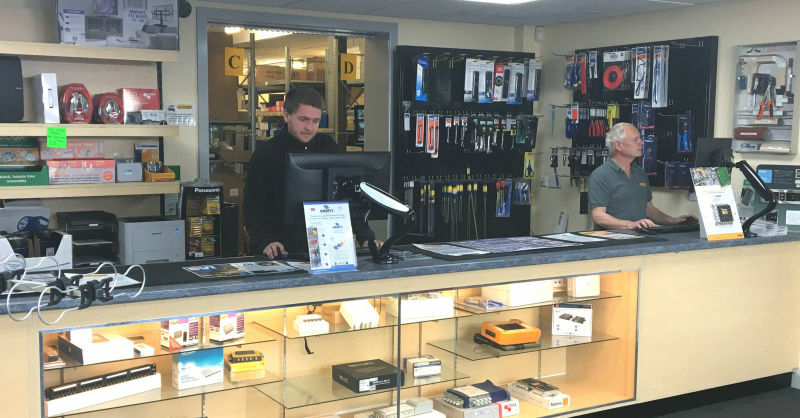 Established in 1989 and incorporated as a limited company in 1995 Alltrade has been a firm favourite as a major distributor to the installation and retail trades for nearly 30 years offering a friendly, reliable, high quality service. Our knowledgeable, loyal and enthusiastic staff have helped us become the No 1. distributor in the industry. Most have been in the team for many years and as we grow we are joined by talented individuals keen to assist in our continued success and development. from all the leading manufacturers’ at the most competitive prices. We are a TRADE ONLY DISTRIBUTOR, we do not and will not sell to the public nor do we operate any websites which sell directly (unlike many other so called wholesalers or distributors). Our commitment is to the trade, the installation and electrical retail trades and we refuse to compete with them. We are adamant we provide the industry with the level of service and confidence by our track record, not empty promises, you are in fact dealing with the industry’s leading supplier. Our reputation is envied across the industry as we offer a service second to none and we guarantee we will not let you down! We were the first back in the 1990’s and still remain the only company today to offer a next day delivery service on our own ﬂeet of vehicles covering almost the entire South of England. NB: Cardiff and Bournemouth branches operate on a frequent but not next day schedule. We are the only company to produce a regular fully priced handy catalogue which is sized to fit neatly in your glove box, ideal for when you can’t get online. We try to keep you informed and show you the latest products, our industry develops fast and products and prices are constantly being reviewed. We continually invest heavily to support the business and sustain growth. 2018 has seen some major investments as we have upgraded all branches to Fibre connections and replaced all our IT. Our VoIP telephone system was cutting edge back in 2004 but now our telephony is on the ‘cloud’ and our entire IT server infrastructure has migrated over to the cloud thus enabling all branches to become completely independent of any system failures at Head Office or other locations.